This Daedric Artifact can be missed if you allow Erandur to destroy it during Waking Nightmare. In Daggerfall and Oblivion, the Skull of Corruption had the ability to clone people. The number of dreams left contained in the staff, as noted in-game, may drop from 0 to -1. 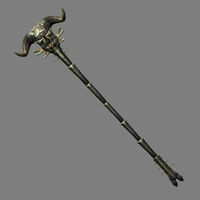 This may cause the artifact to cease any damage output, and is remedied by casting the staff on the sleeping NPC. ? This page was last modified on 19 December 2018, at 19:18.